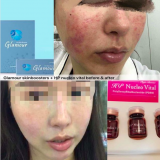 Glamour Hyaluronic Acid Skinboosters has been selling in China, Southeast Asia, and North America since its launch in the Korean market in February, 2017. Customer made mesotherapy treatment review for Glamour Hyaluronic Acid skinboosters online. They responds that the result are excellent after use. Especially outstanding effects for brighten skin tone and hydration. 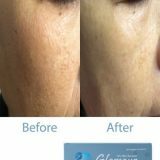 Fine lines are reduced a week after Glamour Hyaluronic Acid Skinboosters mesotherapy. The products have obvious brightening effect on the skin and improve uneven skin tone. The effect of moisturizing and anti-wrinkle last longer than other brand of skinboosters. Especially after three treatments, the effect is obvious and the customer satisfaction is greatly improved. We greatly encourage that our consumers give us feedbacks by sending us before and after pictures, and you are always welcome to write us emails if there are any suggestions and questions. We are happy to hear from you! I am writting a skinboosters treatment review for Glamour Hyaluronic Acid Skinboosters. This brand is suitable for most of the Asian. After having the treatment for once, my skin looks brighten already. My pores seem to be smaller than before. Before having skinboosters treatment, my skin seems to be dry when I apply make up. After Glamour skinboosters treatment, when I apply make up on my face, it seems to be more well set. When I take a selfie, it seems like I am having automatically photo shop ” beauty skin” effects. I am very happy for the result.